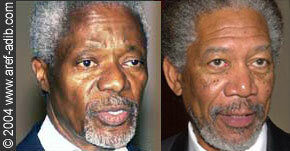 Kofi Annan and Morgan Freeman. The United Nations Secretary-General Kofi Annan has told the BBC the US-led invasion of Iraq was an illegal act that contravened the UN charter. Better late than never!